It’s fascinating when someone young, beautiful and famous dies unexpectedly. Especially, when you know that person through a close friend…and Myspace. When I first heard of Matthew “Jett” Schaefer I was out with a girlfriend in Central Park. It was the summer of 2007. At one point, we were discussing past relationships when she started talking about her ex Jett. I didn’t think much of it at the time. Later I saw Jett’s profile on her Myspace page and clicked on it. Wow!…was my first reaction…and rightfully so after you see just one picture of him. Standing at 6’3″, he was not only quite handsome but also famous, successful and very fit. You could say, he was every woman’s dream man. As time went by, I completely forgot about Jett…until he re-surfaced in a Myspace bulletin late Wednesday night. The bulletin came from a mutual friend and began with “R.I.P…” Shocked by the title, I clicked on it and discovered that Jett died on Wednesday, Jan. 7th after suffering from a rare sinus infection. The infection was the straw that broke the camel’s back because Jett struggled with a battle with cancer for some time. It appeared that he beat the cancer last fall…yet his immune system was so weak from the chemo that when the sinus infection struck, it took his life in a rapid turn. Fot the complete story of his death click here: www.forjett.com/last6/. Ironic? Crazy? Scary? All of that!!! How could a super-fit and healthy hunk on the cover of a fitness magazine talking about “cheating” death die so soon after the magazine hit the newsstands? You may think that’s unfair and it should never happen to someone like Jett. The man was only 36 years old and on top of his modeling career. He was a successful private pilot too in his time away from the spotlight. While I don’t know him personally, I’ve been told that he was a good-hearted and down-to-earth kind of guy. He should have at least enjoyed the blessing of a wife and a child or two before he died. Sadly, that was not in the stars for him. I wonder what Jett’s death has to teach us, the living, about life. Perhaps his Myspace song holds the key to that secret www.myspace.com/gqpilot.. My friend told me that as his condition was deteriorating in the hospital he changed his song. It was the first time I heard “Society” by Eddie Vedder. The lyrics sent chills down my spine…”society, you’re a crazy breed I hope you’re not lonely without me.” Did Jett know the end was near? It seems that he did. You should listen to the whole song so you too can grasp the retrospective message it carries. As I sit here and reflect upon the unfortunate news I can’t help but think of the irony of life. Jett may have not known then but he taught us his most important lesson in the final days of his life. May your soul rest in peace, Jett. The February issue of Muscle & Body magazine will feature a special on Matt’s story with a follow up by his mom Sharron. Apparently, they were also inspired by Matt’s fighting spirit and remarkable battle with leukemia. Keep an eye for the magazine when it hits stands in February. “An individual dies young because he has completed his task. The soul that has passed will be reminded of his task and that it was indeed his time. He will be offered a glance of the future of all those left behind, and he will find comfort and peace in this. Zoe, your blog about my son sounds just like something he would have written. He was a very good writer, and very insightful. Thank you. He actually tried to stop that story in Maximum Fitness, but it had already gone to print when his bone marrow results came in. Ironically, another magazine will have him on the cover, along with a longer interview, in February–Muscle & Body magazine. This time, it went to print with them knowing that Matt had died. They felt it was such an inspiring story that, with our permission, they wanted it to go to print….the editor says it’s almost as though it was meant to be, and that Matt’s timing was remarkable. The article will have great impact. They asked me to help write a follow-up for their March edition when they tell what ensued. Matt often liked to end his “serious” emails with a phrase that ended a rather deep explanation of why people come into our lives. It ends with the words: “Thank you for being a part of my life, whether you were or are a reason, a season or a lifetime.” He had many friends who were each of these to him, and he valued every one of you. Our son often said, from a young age, that he wouldn’t live to age 40. He just had a feeling. He would say it matter-of-factly, as though it was a “given”. I used to get angry with him when he said it. He faced his own mortality bravely, not once, but twice. God has other plans for him the second time through, even though he had BEAT CANCER AGAIN and was in remission. Damn that fungal sinus infection. Matt had completed his destiny on earth. Our son will always be a hero to us. In everyone’s minds and thoughts, he will always be young and fit, because you never saw him otherwise. He actually would like that! He showed us all how to live life to its fullest. When he entered the room, it was like all the warm and bright colors walked in with him, and we all basked in that warmth with him and became those colors, too. Our holidays will be in black and white for a while, I think, until we learn to assimilate his life and death into the essence of our gatherings, and celebrate his remarkable life with our own colors. For our son, 36 years WAS a long life. He did a lot in that span of time…….probably more than most of us will do in a lifetime. We love him immeasurably. Thank you for writing this Zoe. Thank you for being a great friend to me and helping me with this horrible loss. 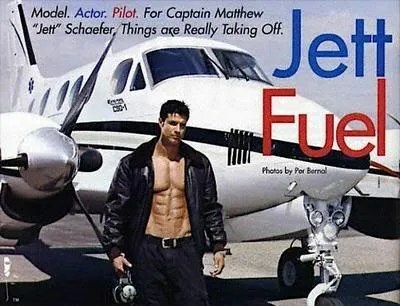 My name is Chad and I only knew of Matthew “Jett” Schaefer from the health and fitness magazines that I subscribe/collect. I soon recognized Jett’s face on the latest cover of Maximum Fitness just the other day and was shocked to learn about his battle with leukemia (cancer). How can anyone so fit, healthy, beautiful and inspirational like Jett, be diagnosed with a rare illness? But that was what Jett was to me and to so many others–truly inspirational. A pilot, a philanthropist, a philosopher, a model citizen, physically and inspirationally! I still have my own copy of the Nov 2005 issue of Fitness Rx, the one with Jett, and often read the article and memorize the exercises which he shot for as a reminder that results from dieting and exercising eventually pay off with enough dedication, strong will and determination. I’ve had Diabetes for the past 15 years now and I constantly strive to achieve a healthier body, stronger mind and relentless soul. I know of a lot of my friends and family who are also diagnosed with diabetes, and very few friends battling cancer. I can only choose to believe that everything happens for a reason and when we die, we do so but never in vain! Every day, I wish for a cure for diabetes and cancer but sometimes realize that I may never be able to see it accomplished in my lifetime. Seeing the images, reading the blogs and googling/discovering the websites dedicated in Jett’s memory will always remind me how precious life is. Though he’s gone, passed on, but never forgotten to his beloved family and friends and many of his fans, Jett’s main purpose in life especially through health, fitness, and his drive to always help others, lives on through our actions and intentions in doing the right thing, unselfishly. As a Philosopher, Bruce Lee once said, “The key to immortality is first living a life worth remembering.” Though I don’t know Jett personally, nor his family/friends, he has truly made an impact on this journey I call life. For me, his images will definitely be something worth remembering! My condolences to his family and friends. May he rest in peace! I am an author of historical romances and found a picture of Jett on the internet about a year ago. I didn’t know who he was at the time, but that picture inspired me to write about my latest hero. A few months ago I finally found out Jett’s name. I visited his webite and loaded my computer with his pictures. The more I read about him, the more I knew he would have made a wonderful medieval hero. Today, I learned that he passed away. I am so very very sorry for his mother, his family, and his friends for this tragic loss of such a vibrant young man. My heart and prayers go out to you all. When my bookis published in the spring, I will dedicate to him. I’m at such a loss for words at this news!!! I’ve been very familiar with Matt’s work for some time. He was a stunning man, and remains a stunning soul!! God Bless him. I was in such shock when I saw him in the edition of Maximum Fitness discussing his battle with cancer … I had no idea he was ill! As a cancer survivor, I found his words inspiring. Matt remains a true hero in my heart and mind. Words cannot express my sorrow or deep sympathies to his family … I only hope and pray they can take comfort in knowing how deeply Matt’s life has impact those countless people who remain inspired by his story. God Bless Matt …. God Bless his family. Zoe, I’m Matt’s sister and just wanted to thank you for writing what you did. My brother & I were very different, but I believe our inner core was the same. I have always envied my brother in the way he chose to live his life…he lived it so fully and was always able to do just what he wanted. He made, as I am learning, such a huge impact on so many people’s lives… I know that if anyone who knew him has learned anything at all from him, he would be happy…and as my mother said, his story has not yet ended with the new cover and article coming out next month. Amazing isn’t it? I am very proud of my brother, and loved him very much. It hurts me to think that I am without him now; more for my daughter’s sake, as he was her Godfather. He was so excited about that and took such pride in it. I like to think that he was called to heaven because my daughter (who suffers from a seizure disorder) needed a really strong angel who would never let her give up her fight. My brother fits that mold well. He never gave up; never quit fighting and worked so hard at all he did in life. He lived a life that many in this world will never know…he was an amazing person with an amazing strength and miss him every minute of every day. My husband gets the Maximum Fitness magazine and I actually read the article on Jett this evening. I was so moved by the article that I googled Jett and was shocked to read about his sudden passing. My heart goes out to his family and friends. I did not have the honor or pleasure of knowing him but in the time it took me to read the article, I was drawn to him and realized what a special person he must have been. What happened to Jet just doean’t seem fair but althoug I didn’t know him I can somehow hear him saying life isn’t fair you just need to make the most of it. From everuthing I have read it appears that he did. Jett, I hope you are at peace and know that you have made a lasting impression with more people tha you will ever realize. Hello Keely. My condolences on the passing of your brother Jett. And please notice that I said PASSING …. not LOSS. Please do not think for one minute that he is gone …. For he is very much a part of your life. When others share the planet with us, we become who we are because of the impact those who love us have on our lives. As Jett has impacted your life in the past, he remains a part of you now and always. You will pass on to your daughter the stories of who Jett was and in turn, she too will be impacted by Jett’s life. I can definitely tell you that Jett has made a difference in my life! As an amateur photographer, I have been aware of Jett’s body of work for some time. When I read of his battle in MF magazine I was shocked and inspired as I too have battled cancer. His story remains an inspiration to me and I am grateful for having known of Jett if only from a distance … I consider him a blessing in my life and only wish I could have known the man himself. My thoughts and prayers are with you, and all your family as you make it from day to day. My condolences to all who knew and loved Jett. I have seen him around before and always considered him one of those “perfect” people, free from physical distress. I’m a former model and had to leave after being diagnosed with Lyme disease and losing 40 lbs. of body weight. I also have developed chronic fungal sinus infections, and candidas overgrowth from extensive treatments. I decided as of a month ago to just give up treatment as I have lost so much weight, sick all the time, and can’t seem to do anything about it. After seeing Jett’s latest magazine and then learning from a friend of his death I am inspired to not give up. I’m inspired to see that someone as passionate as Jett has fought and did not give up. I’ve read his articles now and I’m hopeful that I can pull through my own problems as I realize I’m not alone. I am grateful to Jett’s story and his efforts that all of us can learn from and be inspired. What an amazing guy he IS. My son made Jett his hero. He carries around his MF magazine and says that he wants to be just like him. My son is 19 and has anxiety. He has been body building for a year now and found Jett’s article to be an inspiration to him. He said, “if Jett can beat cancer, I can beat my anxiety”. He still talks about him every day because I haven’t told him he passed away. I know he will be very upset and I know that will cause more anxiety. I pray for the hearts of his family. He was a beautiful man. I had the pleasure of knowing Jett while he was vacationing in Hawaii back in 2002. We welcomed him into our home where he became a big brother to me and my younger brother who was 15 at the time. He shared great stories from his modeling jobs and from flying. I just happened to be browsing online when I saw that he passed away just last month. My family and I would like to send our deepest sympathy to Jett’s family. His laughter and fun loving personality will be missed by us all. To Bradford I’d like to say …. Fight the good fight!!! You can beat it buddy!!! Jett inspired me and so many others …. Do it for Jett. To Lisa …. My thoughts and prayers are also with you and your son as he battles his anxiety … I know he will make it! To Bradford: I know my son would tell you to boost your immune system as much as you can, and to do it in healthy ways–consult a nutritionist if you can–and to not give up. His fungus was of the Rhizopus species, which is pretty deadly, but many of them can be beat as long as you stick with a good physician who you trust knows what he/she’s doing. He would encourage you to have a second opinion if your insurance will handle it, and if you feel you need it. Life is precious…don’t lose faith. To Lisa: Tell your son about Matt’s death, and don’t delay. If you can email me personally, I will send you something that will help you soften that news. Your boy will eventually see follow-up articles in Max Fitness and in Muscle & Body, and you might not be there to deal with his emotions when he sees them. To Tina: So THAT’s where he stayed! I am so glad you got to know Matt while he was on one of his “seeing-the-world” jaunts. How he loved life. Thank you for your kindness to him. I have not heard from his friend Kimo, whose family has a surfing shop somewhere in Hawaii, and who custom-crafted two of Matt’s surfboards. Do you know how I could get in touch with him? I think his last name is Greene?? I had just returned from working with UNICEF in three countries in Africa and had corresponded with Jett less than usual and thought it strange when I wrote to find if he had been getting any flight time on larger jets because I thought I had found him a permanent position with major oil Arab sheik and he was giving me advice about my marriage to the daughter of a billionaire friend of this Arab’s best friend. I was nervous at being in a position so complex and Matt and I spoke and he gave me so much advice and now I find it was all during the period he was ill and never mentioned it to me. I had left the world of management and music when we met online and only once in person. He was looking good and had a great sense of decency and saved me from doing something foolish just with his take on what I was going through.I became intent on getting him flying the large planes and building up his own business.I married and had a son in Japan and named him Matthew because of my admiration and his directness and philosophy and in one email he mentioned that life throws so many things, both negative and positive that you must go on and fight till the end. Now that he is gone, I am deeply sorry for his family about whom he spoke with such love after me telling my own not so good childhood and to find a way to forgive them and get on with life. He had an enormous heart and I would like to know the name of the fungal infection which was mentioned by name and attacked his sinus.He had so much ahead of him even during these times.A rare guy; a sad loss. I’m not sure if he’s still in his shop. My mother was dating Kimo back then and then have since split. You can email me, I believe Zoe is giving you my email address. I’ll let you know the numbers I have and you can give him a call. I’m not sure if he knows since we haven’t talked since they split. It was such a pleasure having your son stay with us. We stayed up late most nights playing video games. Jett and my brother would wrestle till their faces were red and challenge each other to hot sauce eating contests. Haha, I’m sure who won, but the looks on their faces I’ll always remember. He was like an older brother to me as well. Typical teasing and always using my hair brush just to annoy me. 🙂 You had a wonderful son who will be missed by everyone who knew him. Thank you for your kind words everyone. Sharron, you are so gracious and selfless to be concerned with everyone’s posts during what must be a very difficult time for you. What a legacy your son has left. I have been doing the very things you have suggested in regards to my own health. I hope it’s okay, but I also signed up for the ‘Climb for Cancer’ walk this Saturday here in Phoenix. I even donated and asked for donations from friends, telling them about Matt’s story. I have a renewed sense of determination from my depressive slump of the past several weeks. I hope to be surfing in Hawaii before the end of the year if I am diligent and can start to get myself more healthy, as well as regain my immune system. Thanks again for your kind words and obviously excellent parenting. Recently I’ve heard this bad news, sorry for his family. Pardon for my English, I am Spanish and I am not speak very well the idiom. I have passed some days enough sad, I did not know him, but from the day that I saw an image of his, whole of his attracted me, the person seemed very good and happiness, joy were gotten across to. I write small stories at a forum and always the masculine character’s image, when I described any scene, has been Jett I did it thinking about him. I have been days without could have written nothing, now I go back to do it, remembering it in each scene. I didn’t know Matthew personally. The article in Muscle & Boday did caught my eye as I recently lost my mother to multiple myeloma, a form of blood cancer. Reading the article reminded me of the strength that people like Matthew or my mother have in the face of extreme pain. So everyday those of us who are healthy have no excuses to live a health lifestyle and tackle life’s problems everyday. I’m so glad I read the article and learned about Matthew and how he inspired a lot of people! My condolences. I read the article about Jett in Maximum Fitness in January, at a time when my grandfather was dying from cancer. It was a blessing to me. I had no idea at that time that Jett was no longer with us then. May God’s strength bless his family richly! Ur tributes to matthew were truly amazing and so was he….. Why did he have to go so soon….. I will look at his life as inspiration…..
May G-d bless you all….. RIP…..
Jett Schaefer is one of the biggest model/actor in history of modeling. I condole to his family and friends. Maybe in his next life he will be given a longer life by GOD. And I hope we could meet someday even if its not in this time. Hi. I am at a loss for words. I feel so horrible. I was a friend of Jett’s since 2003. We did a photo shoot together for a lingerie company where we got extremely close and kept in contact form many years through emails and phone. I visited Jett in Hollywood in 2004 where he made big impressions on me…I will never forget him. We had a brief romantic relationship but soon went our own ways…never losing contact. I married and am expecting my second son. Jett was so wonderful and amazing and so much more. He was someone special to me. A trusted friend….always would talk to me when I needed someone. I just learned of his death this morning when I hadnt talked to him in a while and I googled him….I knew of his sickness but he said he was free of the cancer….I should have kept in better contact. I feel so awful. I wish I had known.. I wish I could have said goodbye. I really want to visit his stone in Pittsburgh…I am over in Youngstown Ohio. I send my deepest apologies to his family…your son will be missed!!!! Hi, I knew Jett from Bodytech gym back in 1997. I was training for the EAS Body for Life and talked to him regarding diet since he had the most amazing abs that I ever saw. He gave me some idea of what he did for dieting down and training. I was shocked to see him in one of my fitness mags and to learn of his untimely death. This was sad because I had just survived breast cancer one year before the article came out and that was Jan. 2008. I trained during my radiation treatments last summer and I’m hoping to compete in figure. I’m a personal trainer and my goal is to work with cancer survivors and do some fitness modeling so that I can be a blessing to and help others. Its a shock when this disease hits young people. I send my apologies to the family. Jett had always been a great inspiration. I remembered buying the ” Maximum Fitness ” magazine when Jet was on the cover, chronicling his success in battling cancer. He was in top superior shape, I have to say, motivating me to stay healthy and fit. The news of his passing came as a rude shock to me when I made that discovery a few days ago. My deepest condolences to the family for I believe that they have lost a great son. This must be a hard time for them but thanks ( for Mr Larry Schaefer & Mrs Sharron Schaefer ) for bringing up such a fine individual who share with the world not only the importance of perserverance, hard work and determination but also, not to give up easily. He will always be an inspiration to me. Rest in peace, Jett! I really enjoyed reading your article, keep up making such interesting posts!! Yes, he has to be the same Matt unfortunately. I remember him and Keely. So sad to find out he passed away. I was just randomly searching for people from my past and came across this memorial. Damn! Thank you! Maybe you could edit the blog subject R.I.P. Matthew “Jett” Schaefer to something more suited for your blog post you write. I enjoyed the post even sononetheless. I am shocked and very sad to read that Jett has died. I met him in Malibu around Dec 2003 I believe.. He was so nice to me because I was on the other side of the world from my house and was brutually dumped by my then boyfriend. We even stayed in touch after that. I just have been thinking bout him lately how he could be, maybe I could find him on facebook when I found this site. Unbelievable. His family should be proud to have raised a man like Jett, he had a good heart, his looks was just a bonus. Rest in pease. Matthew will ALWAYS be an inspiration to me. He still amazes me to this very day. I am a fellow fitness model that has followed Matthew’s career for years. This story breaks my heart but at the same time I know that his mission here on earth was complete and that his life on earth was cut short so he could do other things. We think about you and pray for you Matthew. Please send me some inspiration to get over this hard time in my life buddy. Thank you and God Bless the Schaefer family. I don’t know if this blog is still active in regards to the beautiful and sad story of Matthew “Jett” Schaefer’s life. But I hoping so, because I would truly love to start a facebook page in Matthew’s name. I want it to be both a tribute in part, to his life and a page of inspirtation to others. You may ask, why in Matthew’s name. Well, in short, I came upon his picture, biography and story of his life by chance. I will explain more, maybe if I can set up his facebook tribute page. I do not want to do that without his parents’/family’s approval. Let’s just say his story has inspired me at a time I needed it and I’m hoping by doing this it will do the same for others. My email address is connected to this post and I’m hoping, Zoe, owner of this blog is still here. Zoe, if you’d share this with any of Matt’s family, I would greatly appreciate it. Would love to setup the page format to begin on his birthday, March 27. Any info would be greatly appreciated. Thank you. A website is maintained for our son by someone who was a close friend. We feel that is enough. I am uncomfortable with someone who did not know him starting a Facebook page with his name on it. Thank you for responding, Sharron. Celeste, please respect Matthew’s mom request. Thank you. I meant no disrespect in leaving this message here on your blog Zoe. Mrs. Schaefer, I respect your feelings and this is why I made the request. The page was never started and will not. All the best to the Schaefer family. Please do me the courtesy, Zoe, to delete my comments above. Thank you. Almost 10 years later I find this tribute. Jett meant the world to me!!! I remember you Mrs. Schaefer. I have a son now and couldn’t imagine losing him. I pray my late response doesn’t recall any pain for anyone. I just wanted to write to say what an amazing man Jett was!!! He’s been on my heart a lot lately. I hope everyone is well.